It is so much fun to use napkins when creating cards or scrapbook layouts. In fact there are all kinds of wonderful napkins out there which are easy on the budget. Years ago Carol Duval introduced me to the use of napkins when on her show she created a set of note cards using only napkins. The easiest way to adhere the napkin is with plastic wrap and an iron. Lol! It is the only time my iron gets used. Make sure you use the iron on parchment paper or copy paper and do not move the iron back and forth. I let my iron sit for about 10 seconds and then move it to another spot. Pay particular attention to the corners. I have never needed it but I always have a fire extinguisher near by. After the napkin was down tight I went and edged it with laser green tape I bought at Dollar Tree. It comes in a four pack . Alas not all Dollar Tree stores seem to carry it as the one I was at yesterday did not have it. Good thing I stocked up at Christmas time. :-) After I glued the card with the napkin down on my base I took a sepia color piece of chalk and rubbed over the whole card. The pattern paper originally had white in it as well as the white background in the napkin. I wanted something not so stark to go with this period image. I then went and edged the card base with ink. The image I believe is by Fairy Graphic. Last year I turned her into a cutting file. I decided I wanted her more sepia than she originally was. I love now that in the Studio software I can do special effects with images instead of having to take an image first into another program. This time I went ahead and created an offset as I wanted to pop dot her on a mat. After she was cut out I took my old standby Vintage Photo ink and edged the image. I found that a stencil dauber works great and gets into the corners. For the offset I scribbled two different colors of green chalk on it and then blended the colors with a cotton ball. Then I edged the offset with gold ink. It is an antique gold color which I bought years ago. I'm not even sure the company is still in business. I like to use it because it is not brassy like some gold inks. There you have it my fairly quick St. Patrick Day card since I had already created the original cutting file. It took me longer to get a decent picture of the card than to make it. Have you used napkins in your crafting? 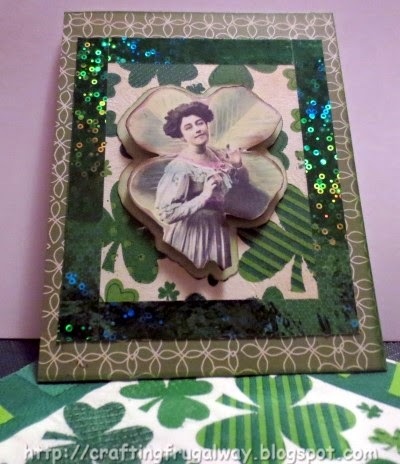 Do you make and send St. Patrick Day cards? That's all folks for now. 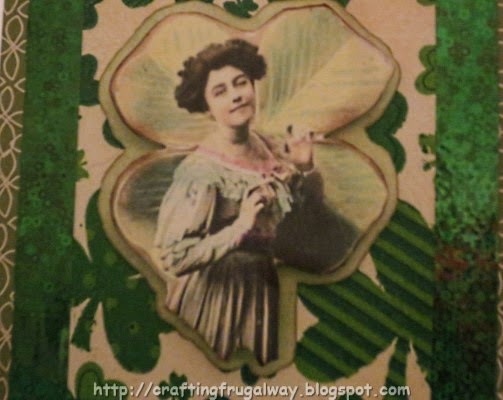 I'm working on another St. Patrick Day card and hope to share it soon. 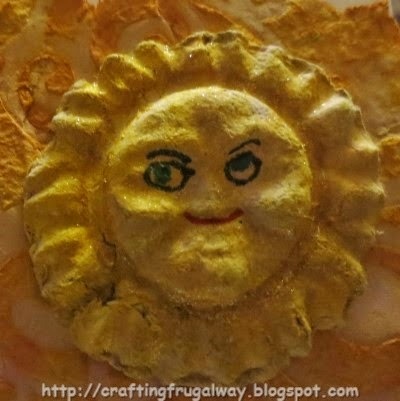 In the meantime wishing you Happy Frugal Crafting till we meet again! I decided to paint my card first since I knew that the negative from using a Sizzix flower die was not going to cover the whole card. I used Wild Honey Distress Paint which I misted after daubing it on. While looking through the library in Studio I noticed I had grungy text paper. It was a free file one week. (Now why couldn't I have found it for earlier challenges!) I printed it out and used my die. Now I have three nice text flower petals to use for something else. :-) I decided instead of using washi tape for this card to experiment. I embossed athletic tape using a Darice flourish border folder. I then airbrushed it and rubbed Distress Ink over the tape. One word of warning be sure to place the tape first on paper before embossing unless you want a mess to clean and perhaps even ruin your folder.. Luckily I was able to salvage the folder so it is still usable. I also backed my flower window with gold laser tape which is sold at Dollar Tree. My camera picked up reflections in the room. 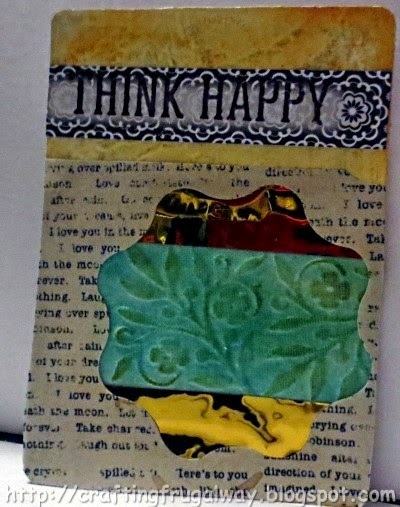 My sentiment is a stamp by Studio G and is stamped on a post it note strip found at Dollar Tree. I just stamped the Think Happy part of the stamp. You don't always have to use the whole stamp or all of a quotation. The tape used here to cover the card is by Studio G and was bought at WalMart for under a dollar a roll. 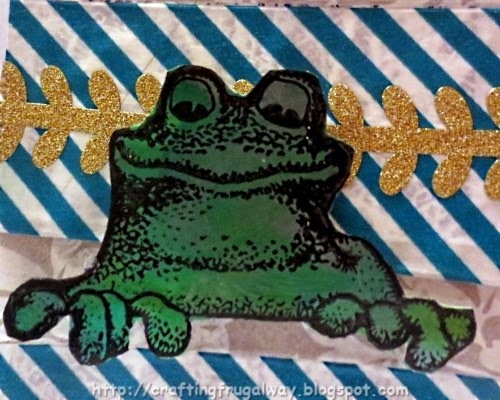 The glitter design tape is also by Studio G. I would love to find more of this tape in different colors. This time instead of stamping my sentiment I used my label maker with clear tape. Then placed the tape onto a post it note strip. Can't wait to see what next week's challenge is. They are so fun to do and get me to use and try different things. Do you use decorative tape in your crating? If you have a embossing machine have you tried to emboss on different things? Thank you for stopping by and do come back. In the meantime wishing you happy frugal crafting till we meet again! Just kidding about the winning prize is mine whether I win or not doesn't matter as I had a blast creating this little work of art using their window stamp and some ancient stamps I had from the 90's. It is kind of nice to once in awhile pull out some old friends and reminiscence about days gone by. It is also nice to play with different things in my "playroom" including some brand new gouache used for coloring. Enough yapping as I know you want to see what I did with the window stamp. Here is my card and I love how it turned out. Although I'm not so sure that I can part with it now. I might just have to frame it for decorating my "playroom". I started out by stamping three different colors of Distress Ink onto a sheet of plastic and then misted it with water. It could also be misted with a shimmer spray. I just didn't have any made up. Then I plopped photo paper glossy side down in the ink.. It doesn't matter what brand you use.I usually buy mine at Dollar Tree when they have it.) You could probably also use glossy card but I don't have a lot of it and have a difficult time finding it at the price I want to pay. If your paper or card curls you can mist it on the backside and it should flatten out. When it was dried although I was terrified I was going to mess it up I stamped the sun with sentiment using Stazon ink. The sun is a Stamping Up Stamp I won so I don't know if it is still available. I then painted the sun with gouache layering it on tying to get a yellow instead of a green sun. Lol! I like to stamp everything out at one time so using Stazon ink I first stamped the kitty which was actually in a basket of ornaments. I'm pretty sure the stamp is long since retired and the company may no longer be in business. The same with the tulip stamp but you can always find similar stamps. (Also remember to look at your stamps as you may be able to use only a portion of a stamp.) Then I stamped the window. These stamped images were colored with gouache. Gouache is similar to watercolor but usually dries faster and is more opaque. This was my first time using Gouache which comes in tubes and it will take some practice getting the right constancy. After everything was painted I cut with scissors and a craft knife. By the way if you have not invested in a finger swivel craft knife you might want to as it is great for cutting out small areas..After the window was cut out I very carefully glued lace to the back. 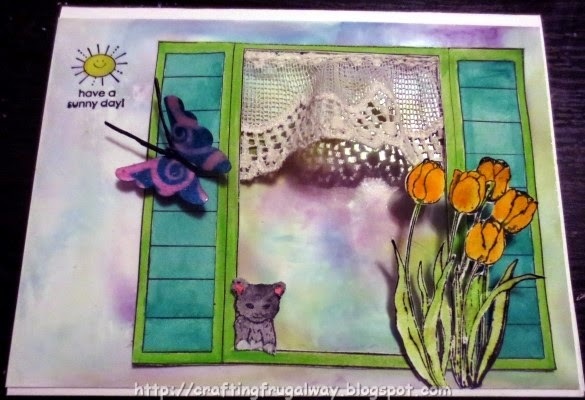 Then I carefully glued the kitty to the frame.and glued the window to the background. It is a little tricky with the window sill being so narrow but a glue eraser comes in handy and didn't seem to ruin the background. The butterfly was one in my stash. I was going to use an embossed butterfly but that envelope has disappeared. I air brushed with a Spectrurm Noir marker and then used a stencil with a Sharpie and my eBrush. I then colored the body with a black Sharpie and heat embossed with clear Ultra Thick Embossing Enamel. I had to do several layers but was amazed at how it made the colors to really pop. For some reason using this cutting file the head and antennas always tear off on the smaller ones so I used floss for those. and then pop dotted it on the window with the antennas pointing to the sentiment. The tulips was the first thing I tried painting with my new gouache paints. I only bought the starter set but the colors can be blended. Because they are water based any waterproof ink will work. I just love the crispness I get using Stazon and finally bought the black. I love how colors can be layered using gouache. Now I wonder why it took so long before I bought any. Then I used a VersaMarker pen and fine detail clear embossing powder for the look of dew. Sorry for the glare on them but it really looks like a fine coating of water droplets. Ultra Thick Embossing Enamel would give more of a raindrop look as perhaps coarser embossing powder. 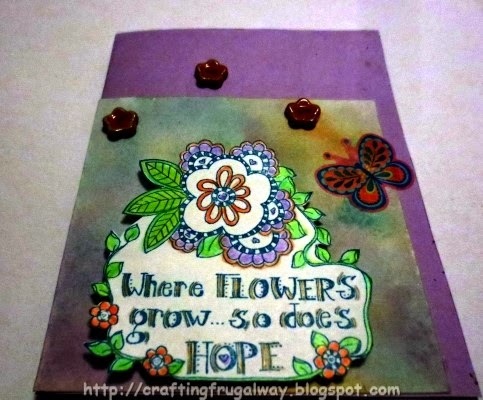 There you have it my card using the High Hopes Window stamp. Don't be surprised to see this stamp used on other cards. I already have several ideas swirling around in my head. If you decide to buy this stamp please leave me a comment with a link to what you did with it. It looks like with a little bit of imagination it could be a fun stamp to use. That's all folks! Off to spend my fifteen minutes creating and my fifteen minutes cleaning and organizing my playroom. Since the wind is blowing it may end up being longer. 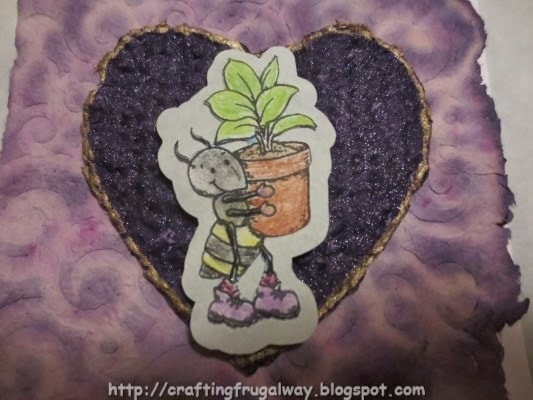 :-) Wishing you a craft filled weekend and Happy Frugal Crafting till we meet again! Hi everyone I finally finished this week's challenge yesterday but it was indeed a challenge for me. Things just were not working out the way as planned. Yesterday I had to just walk away a few times. Luckily the weather was nice although a little chilly so I was able to take my boys on a longer walk. Both boys were tails up and doing a dancing step. The first one I tried painting with some antique gold paint I have. It was too thin and the white gesso showed through. I then used Wild Honey Distress paint which colored the gesso and ended up painting a taupe over that. When the paint was dried I used a lattice stencil I had cut out a few years ago. I then rubbed copper Brilliance ink over the stencil after trying the gold and there not being enough of a contrast. While the stencil was still in place I used a Fancy Pants stamp and brown Stazon ink. I ended up having to keep moving the stamp and re-stamping as in places it just was not stamping. I wish now that I had stamped the butterfly further down so that it was on the squares with not as much script. Luckily there was a residue of ink on my ancient butterfly stamp as I stamped it with a glue pad and tried to burnish DecoFoil over it but the foil didn't transfer. Then I tried my 2 way glue but that didn't work either. Guess Ill have to get transfer adhesive. Argh! I still can't find my set of Gellyroll pens. I did however find my clear glitter Gellyroll pens so used that on the butterfly. 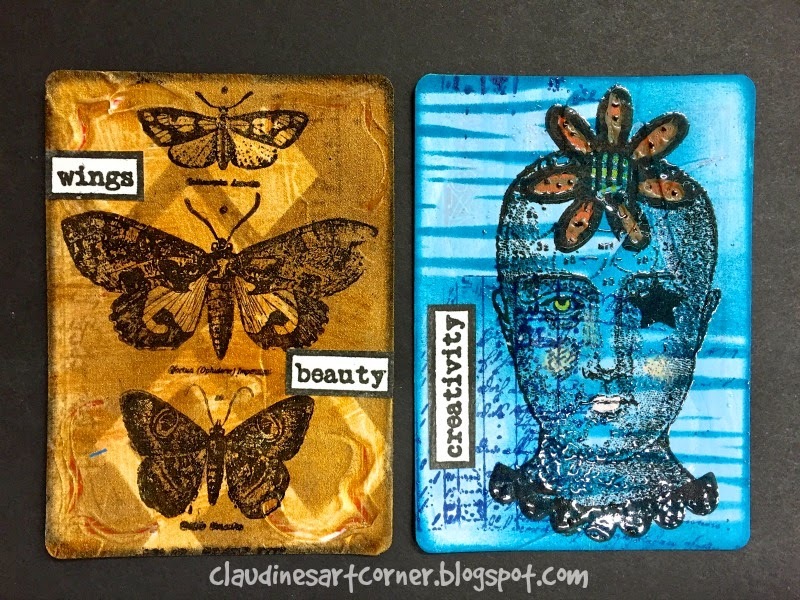 Then I stamped using a stamp from Inkadinkado "Inspiration Lift and Fiskar Butterfly Magic. Then edged the card with black ink. The second card my torn mask did work out so I used a stencil with Brilliance Sky blu ink after the sky blue paint was dry. Then I used another stencil with a off brand dark blue dye ink.which was given to me. 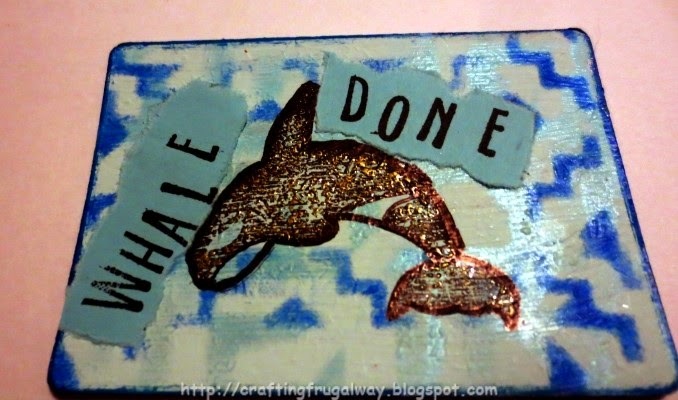 I stamped the whale with a black ink and used antique embossing powder. I have had the embossing powder for ages and would like to find more of it. For some reason it didn't totally emboss. I love how the solid areas in the stamp ended up instead taking on the lines from the paint. I took a black Sharpie and outlined and went over some of the details. I tried Hero Art alphabet stamps to stamp my words right on the card but alas even doing ink to stamp I got ink from places on the stamp I didn't want. I ended up stamping on blue copy paper as it is it took me several tries. I just bought Stazon blue ink so went ahead and edged with that using a stencil dauber. I found out that using the inkpad to edge can ruin them. I'm waiting for my blending tools to come to use those. There you have it my challenging challenge cards. Now the other challenge is to find the charger for my camera. It was not where I normally keep it. I'm off to find the battery charger and do some more rearranging in my craft room as I have ink pads coming in the mail and a few other goodies. Plus I must confess I did some shopping Tuesday so need to put away those goodies so I know where they are. I hope your crafting is not as challenging for you. Wishing you Happy Frugal Crafting till we meet again! Hi everyone I hope you are doing well.. The weather is a little warmer but it is still cold and also no real sunshine. I'm ready for sunshine and warmer temperatures. The crocuses and daffodils are beginning to poke their heads up and so I have hope that Spring will be not too far behind. And that leads me into today's post.When I saw the "Where Flowers Grow" stamp over at High Hopes I knew that I would have to buy it even though my crafting budget has been stretched to the limit lately. I bought a couple of other stamps but the one will probably wait to be used until next winter. Enough yapping on my part. LOL! Without further ado here is the card I created after many changes and being unhappy with how it was turning out. I decided to use my embossed border for another project as it just didn't look right. I tried ribbon on the side and didn't like that. 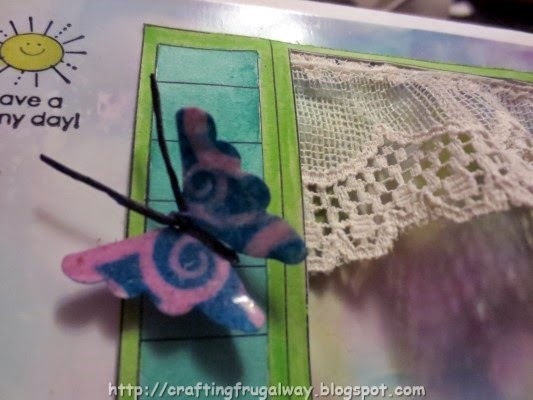 Unfortunately in one place where I had the ribbon glued down the glue left a stain.. Then I saw the thin acetate stickers someone sent me years ago and this butterfly was perfect. Sorry I could not get a good full card photo with the buttons. See closeup below. I decided that I wanted to go with a little brighter colors so although I used my signature purple I added orange along with a blue. It was suppose to be a teal blue but for some reason my Stazon teal blue and Distress ink which is a teal blue didn't end up that way. I came up with this color combination because I was thinking of a favorite skirt which alas I outgrew. Of course I had to add green in the stamped image which is a neutral color. I'm taking a class about the different inks online and the first lesson is on dye inks. I already knew how to do the technique for creating Distress Ink backgrounds and to be honest until I bought a blue the few Distress Inks I have were mainly used for edging images or once in awhile creating a background with a cotton ball. I love how this background turned out. but unfortunately now I' want even more colors. I've done this same technique with regular dye inks but it is not as watercolor looking. I decided I wanted to use some flower shape adhesive buttons I have by Studio G. Since I didn't have any teal blue or orange buttons I airbrushed them with an orange Sharpie. The orange was too red orange so I sprayed yellow on top. I bought the stamp unmounted and used removable double sided tape to adhere the stamp to an acrylic block. I prefer to do it that way as not only are the stamps cheaper but take up less space to store. 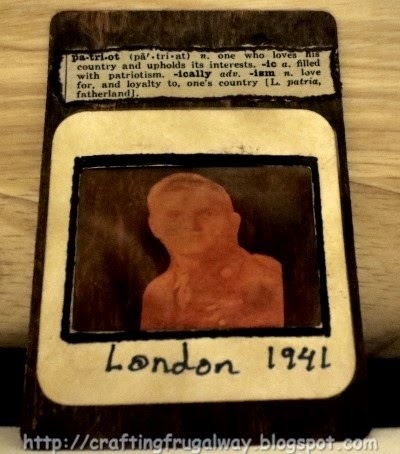 Then I've found sometimes in order to get a crisp image to stamp using a foam pad like a mouse pad. It depends on what you are using whether you will have to do this or not. In this instance the paper was slightly textured. Then I got to have fun playing with my color pencils. Of course I had to sharpen some of the pencils first. I don't know why it took me so long to break out the pencils and start to use them. I was going to play with my gelli plate which has been feeling neglected last week but never got around to it so I'm off to play now. Thank you for stopping by and do come back later on this week to see what the Altered Playing Card challenge is. It is anyone's guess right now. Only Claudine knows what it will be. Hi everyone I've probably lost my credibility of being a frugal crafter as I once again went on a shopping spree. I went into Jo Ann's to buy a blue Distress Ink since my colors of Distress Ink are really limited and came out with five embossing folders. I had been drooling over the embossing folder I used for this card and one other but they were $5 each. So when I could get both folders and three others for $10 I went for it. Lol! I did remember to buy my blue ink which was on sale. O.K. 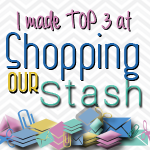 I know you don't want to read about me falling off the wagon and spending money on crafting goodies so on with the post. Here is the card I made. I don't know about you but I'm ready for Spring so decided to make a Spring Birthday card since I know people with Spring birthdays. I started by taking a Darice embossing folder and inking the Darice side with Concord Grape, Peeled Paint, and Tumbler Blue randomly.. Then I took my mister bottle and misted the folder and placed my card stock in it and embossed. This is what I ended up with. 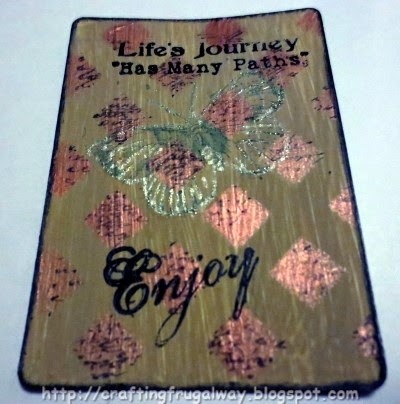 It is always fun to use embossing folders this way as you never know what you will end up with. Of course now I need to buy even more colors of Distress Ink. Lol! Then I took my Versamark watermark ink pad to stamp my Cherry Blossom Bird. I don't know if this stamp by Stampabilities is still available or not. I guess I had not cleaned the stamp well enough the last time I used it as when I stamped my image was colored. Which in this case was all right as it made it easier to color with chalk. After my image colored I carefully cut it out by hand. The bottom of the image was adhered with tape and the bird and flowers are pop dotted on the card. I took a cut out left over from cutting a frame out and cut it to make the tag for the sentiment. Normally I don't use Distress Ink for stamping sentiments because the ink as the name says distresses so you don't get a sharp ,crisp image. In this case though I wanted a softness. I then edged my tag with a purple pearl DecoFabric marker. The markers don't work well in my air brush but I love using them for other things. There you have it my Spring card now if Spring can hurry up and come to my neck of the woods I"ll be happy. Are you ready for Spring? Hi everyone this week's altered playing cards was a challenge. The challenge was to use Elmer's glue with a stencil. Not only did the glue run but it took forever to dry. If I remember correctly last time I tried glue with stencils I used the gel glue instead of school glue. Oh well it was fun playing and although the diagonal stencil ran I like the way it turned out using a glaze over the paint. 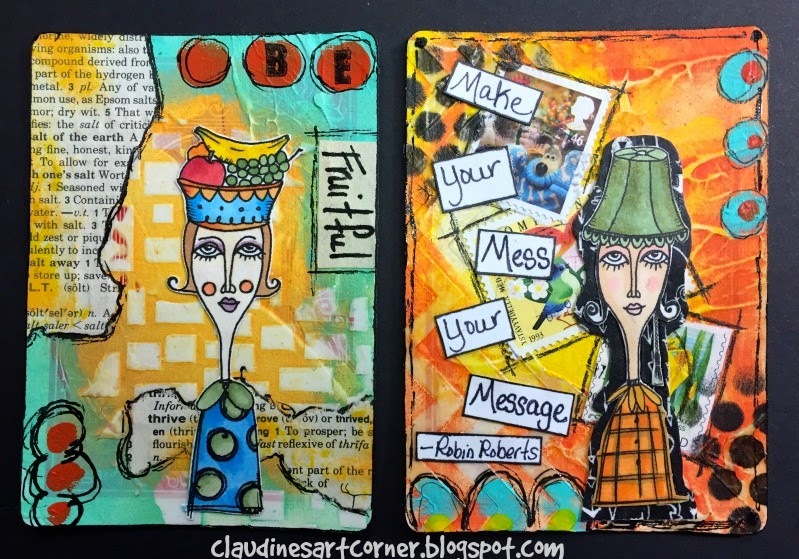 Here is Claudine's cards for this week. I am not totally happy the way this one turned out. I was trying to make it look like an old slide. I took a card I had used gesso and a circles stencil and placed that same stencil on it and used Elmer's glue with this stencil it didn't run too bad. When it was dry I painted with Cafe Au Lait and Nutmeg paint. Then after that dried I brushed on Walnut gel stain and let it sit for awhile. Then I took a dry brush and brush off paint. The slide was a free Silhouette file. I cut it out and attached plastic which I had air brushed orange on. Then glued my cut out. The slide looked too stark so I used Antique Distress Linen on it and a black Sharpie. I decided since the photo is of someone in a military uniform to tear out the word patriot from a dictionary. I edged that with a black Sharpie. I love hos this one turned out although I was unhappy with the glue and stencil since the glue ran together. Not only that but it took several hours before I could staart using paint. I started by painting with Peridot paint which is a metallic paint. It dries really quickly and gives a nice sheen. I then mixed Ivy Green with a glaze additive. Painted it on and let it sit for a few minutes. Then I took a paper towel and wiped in a circular motion removing paint. I stamped only the Remember part of a stamp on white tissue paper and heat embossed with copper. The lighting faded it out in the photo. I then glued it down using Vintage Creative Medium to take the starkness away from the white tissue paper. I found the neat post card tape at Dollar Tree alas when I went back a couple of days later they were sold out. I will keep my eyes out at different Dollar Trees and maybe I can pick up some more of the tape. I stamped my lady who was originally a stamp with her on a playing card with Memento black ink. 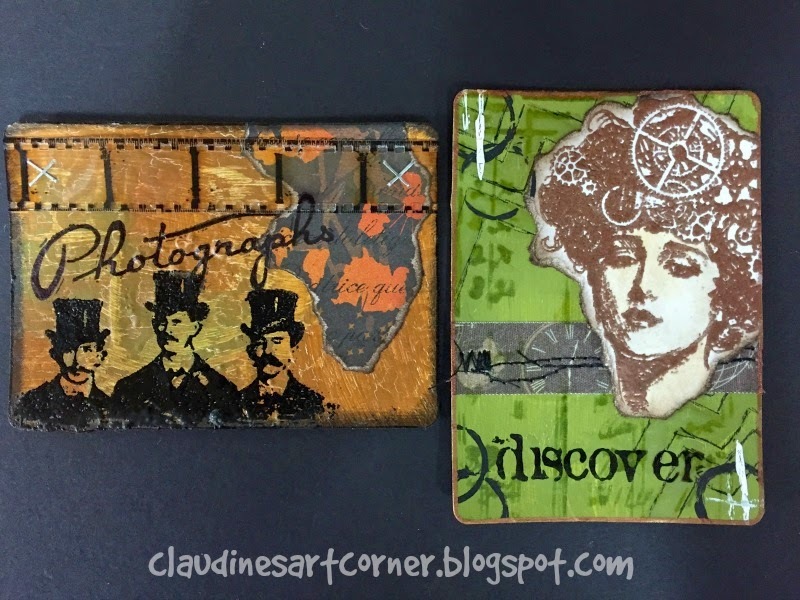 I had first tried to heat emboss with copper like Claudine did but too many fine details. She is colored with chalk and with color pencil. as well as some old eye shadow.I was terrified that I was going to mess up doing the eyes and lips with color pencil but they turned out just fine. There you have it this week's altered playing cards. I'm off to running errands. Wishing you Happy Frugal Crafting till we meet again! I spent an enjoyable Sunday putting together this card. I thought when I saw how the background turned out to enter it in the Oranges and Lemons challenge until I found out that the rules stated one entry per person. However, I'm doing a personal challenge as part of a facebook group. One of the challenges is to do something using wood. Oh the shame I've had these Studio Calico wood veneer pieces since I won them three years ago and have never done anything with them. In fact they were still in the original packaging unopened. First off I've read that anyone can learn to draw. I've tried and tried but alas not only did I flunk drawing 101 but also Art Appreciation when the requirement unknown to me was that drawing was involved. Believe you me if I would have known I never would have taken the class. You have been forewarned. ;-) If you are brave enough then continue reading. I decided to experiment with drawing with a white crayon and drawing with a white oil pastel. I decided to go with the white pastel. Lol! Although to be honest the white crayon flower was better. I stamped Distress Ink on a acrylic block and then misted it. I then stamped it on my oil pastel drawing. The oil pastel resisted the ink. I decided the flower needed more definition and first tried my white gel pen but that was no go. I then opened up a tube of Puffy White fabric paint. The Distress Ink changed the color of the paint but I like that it is not stark like the white was. (I've never really played with the fabric paints and can tell I'm going to need more practice before I actually use them on fabric. When the paint was dry I put the saying wood piece in the middle. The HELLO is stamped on yellow tissue paper which I had air brushed some speckles using an orange and green Sharpie. I used a Ki alphabet which I bought for a dollar. I keep forgetting when I go to the store that had them to see if they still have some other fonts.I used a yellow Sharpie to color the center of the wooden flowers. After my flower panel and my stamped panel were adhered to the card base I took some raffia and glued down to hide the seam. Thin ribbon would have worked also but I think the raffia is more in keeping with the earthy tone. Since the idea behind the facebook group is to get out and use what we have I did real good. Like I mentioned the wood veneer pieces had never been used. The tube of white fabric paint was still sealed as was the roll of raffia. 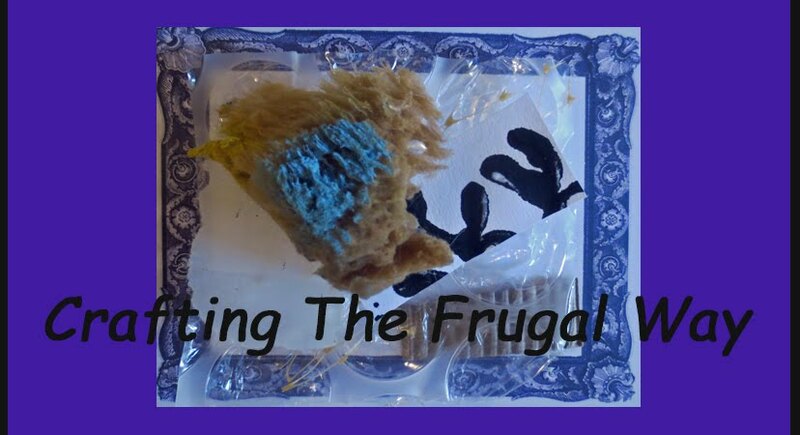 My frugal tip is to clean and organize so you know what you have and then use what you have or give it away. See you later on this week with the altered playing card challenge post. Wishing you Happy Frugal Crafting till we meet again! Since I made one of my goals this year to enter more challenges I decided to create a card and my fifteen minutes crafting for the day ended up being longer. LOL! In fact my friend finally dragged me out of the craft room to go thrift store shopping so what did I buy. An old paperback dictionary to tear up and a sewing pattern to use in crafting not in sewing. After some thought this is what I came up with. I started out by taking my Plaid heart stencil and left over paper pulp and making my stencil paper. While it was still damp I used my air brush and a Spectrum Noir marker to spray the stencil coloring the hearts. I had previously made the large heart in a soap mold with the paper pulp. 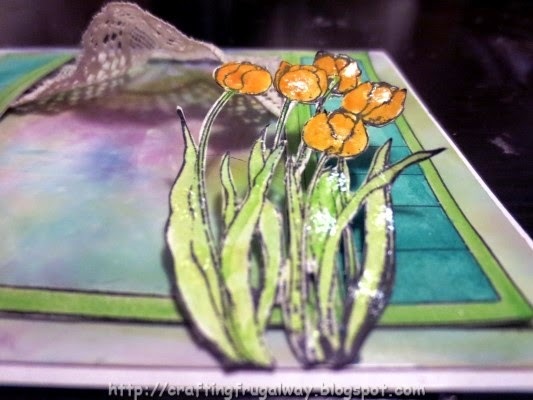 I first placed a few drops of alcohol ink in the soap mold before adding the pulp.. It is always fun to do as you are never sure what you will get pattern wise. The butterfly and sentiment are from Fiskars Butterfly Magic stamp set. I first stamped them both on plastic using Stazon ink but I didn't like the way the sentiment turned out. I sprayed wrapping tissue paper with my air brush and Spectrum Noir markers. As well as with the gold Decofabric glitter marker. I then stamped the sentiment "you make my heart flutter" on a piece of the tissue paper and tore it out. The rest of the tissue paper was adhered to the back of the butterfly with acrylic floor wax. Once it was dry I cut the butterfly out. Then used a black Glaze pen for the body. I didn't like the stamped antennas so cut them off. I colored a piece of floss with a black Sharpie and adhered small rhinestones on each. Then glued it to the back. I glued the butterfly on the front of the heart. 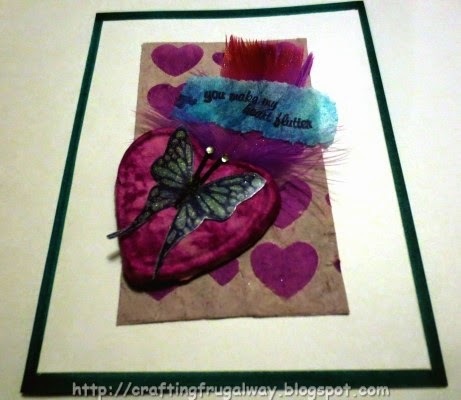 Then glued a feather from a pack I had bought at Dollar tree on the back of the heart. The sentiment was then glued on the feather. I was in a hurry so finished drying the stencil paper with my heat gun. However, it curled a little bit so while eating dinner it sat under a pile of books. I trimmed the paper and learned that it will not cut nicely with a paper trimmer. :-( So I ended up cutting it narrower than I had planned. Then the heart was attached to the stencil paper and the paper adhered to the front of the card. 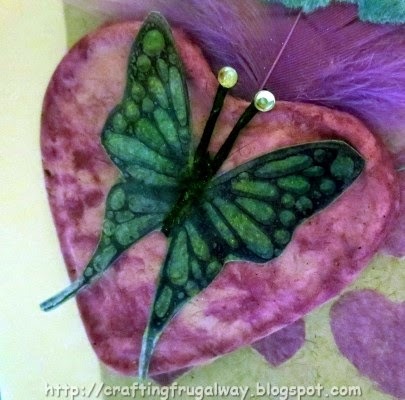 I so love how both the paper pulp heart turned out and how my butterfly turned out. Good thing I bought that large box of page protectors at a thrift store for crafting with. I love how stamping on plastic and then adhering colored tissue paper or tissue paper I've colored in some way.turns out. I attempted to air brush the feather with the gold glitter marker but it didn't really turn out the way I had planned. I was really disappointed when I opened the package of feathers to find that many of the feather had been chopped off like this one and that there are so many small bits and pieces. I guess it is true you get what you pay for. I'm just thankful that I only bought the one package. 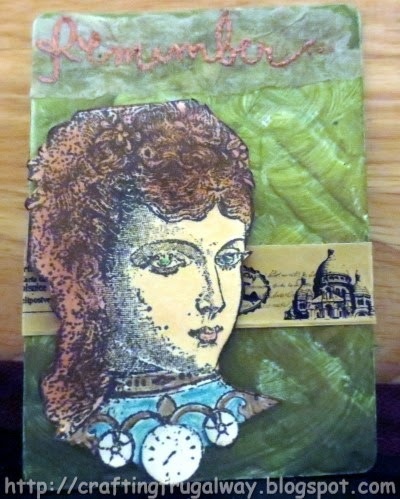 I encourage you to try some mixed media in your paper crafting. Also I want to encourage you to do some challenges. As a friend of mine was fond of saying the more time you spend being creative the more creative you become. I know at least for me that is true because now if I miss my fifteen minutes of being creative I'm all out of sorts. And if I miss too many days then my creativity seems to leave me. One of my goals for this year is to enter more challenges. When I saw Claudine's post about the Stampotique Oranges and Lemons challenge I just knew I was going to have to enter it. 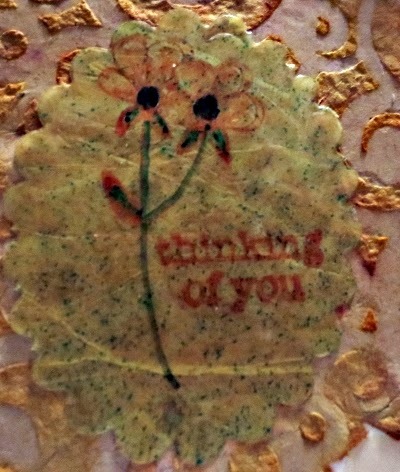 Especially since I had just made stenciled paper which I used Mandarin Orange distress ink to add color. I made my stencil paper and colored it with my Distress Ink. I need to work on getting a full size sheet but in a way I like the fact that the paper is not rectangle but more a random shape. I'm not sure how it will cut with my paper trimmer but it can be torn by hand. which I did on the folded edge where it overlapped. 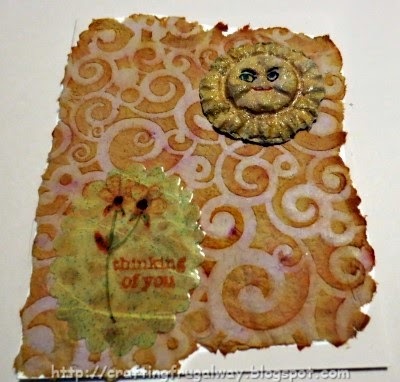 The sentiment with flowers is a Studio G stamp which was stamped on plastic. I used Rusty Brown Stazon ink. Then I colored the flowers with PrismaColor markers. I used glitter markers and my airbrush on tissue paper and then using acrylic floor wax adhered it down. When it was dry I ran it through my embossing machine with a Spellbinder die. It was interesting to see the design the embossing machine created with the tissue paper being ran through. It was wrinkled tissue paper which was the only bright yellow I could find. The yellow is faded in this photo. Opps! I made the mistake of not coating my soap mold with cooking spray before putting my pulp in so the sun tore a little getting it out of the mold. I airbrushed it with a yellow Prismacolor marker and then with Gold Medal Crayola Glitter Marker. As you can see in the first picture it really sparkles. I then took Sharpie markers for my face. Don't laugh because I got the one eye wonky but it does goe with the lifted eyebrow. Lol! Because I didn't want to make the mistake I made the first time I used paper pulp in soap molds the center is indented on the back so I had to adhere it with a foam square. I felt the edges were too fragile to use a glue runner on. Although the glitter does not show in this photo the gold medal is a bright yellow gold. Normally I don't use orange and yellows in my crafting so it was fun to do something different for a change. Wishing you Happy Frugal Crafting till we meet again and thanks for stopping by! 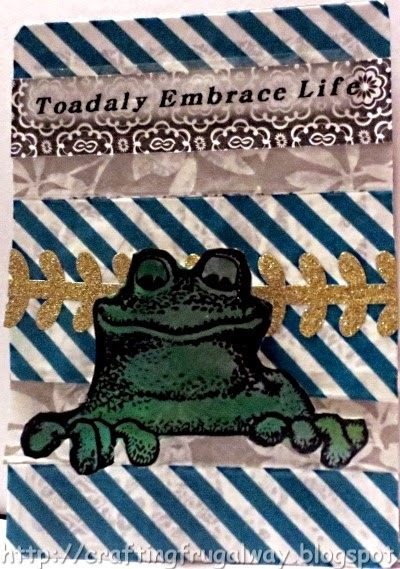 My dear friend Beth Norman gave me a link to a design team call for High Hopes Rubber stamps. I had never heard of them but decided to apply after looking at their catalog of cute and whimsical stamps. I wasn't picked for the design team but thought it would be fun to start to enter some of their challenges. I don't own any of their stamps yet but have placed an order. Luckily they are nice and provide a free digi stamp to use for challenges. There are some advantages to using a digi stamp but I'll be honest I would much prefer to use a rubber stamp. There are advantages to getting all inky also. 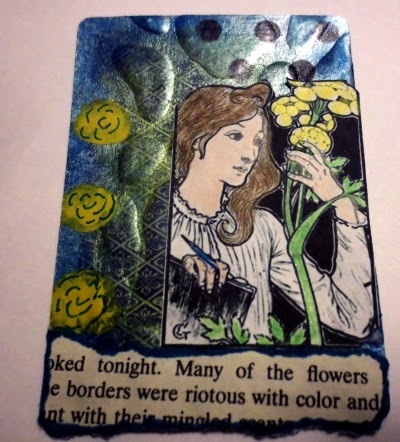 Since I've been playing with paper pulp since Saturday I decided to use some of my play for this card. 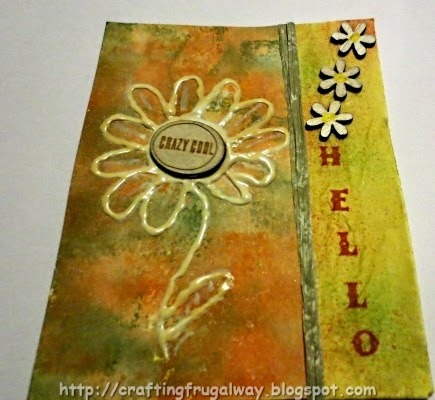 Who knew that you could use a stencil with paper pulp to create your own unique paper! Or that you could use a plastic canvas shape to create unique shapes. Drum roll please! For this card I started by making a piece of stencil paper. I had already played with pulp and stencils and decided to experiment. 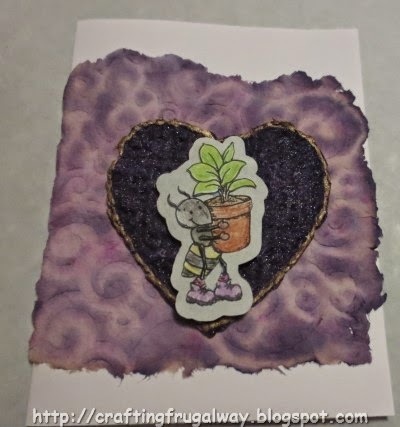 First I stamped on a piece of card using Concord Grape Distress Ink. Then I placed my stencil down on the card and applied my pulp. I couched the pulp enough for the fibers to cling together and then turned over the stencil which now was coated. I then stamped my distress ink over the stencil and continued squeezing water out with an old towel. The more you apply pressure with the towel the thinner your paper will become. Once the fibers are sticking together you can use a rolling pen over a towel, old sheet or whatever you are using.You can use paper towels in the beginning but eventually they will stick to the paper you are making.. I learned that when I first dabbled in paper making years ago using an old screen. .The heart was made using paper pulp and a plastic canvas heart. You will get the weave of the canvas in your finished paper shape. I used the deboss side for this card. I used my airbrush with a fabric glitter marker. I only have the purple Decofabric marker but I have an order coming with more colors. :-) (Yes, Beth I do once in awhile buy things. ) I edged the heart with a gold paint pen I found when I was cleaning. I love how sparkly the glitter marker makes the heart. Alas this poor bee lost his cute hearts on his antennae when my machine cut him out. I tried two times and finally gave up. I did an offset so I could mount him on an offset. I colored the image with Prismacolor color pencils. I will try to do a tutorial soon on making paper pulp and using it for different things. 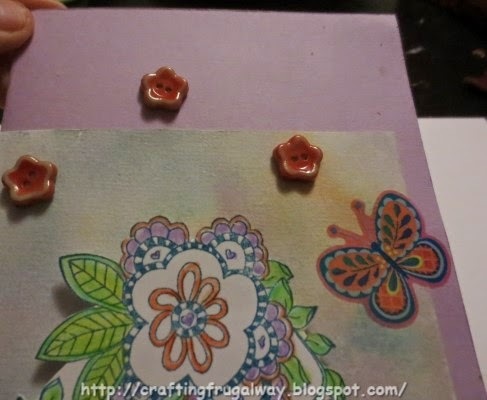 In the past and I also did some this time I used mini soap molds to make paper embellishments. I also this time did experimenting with using embossing folders with the pulp as well as with stencils and plastic canvas. In the meantime it is easy to make your own paper pulp to play with. Rip or shred paper. You can use old bills, things you printed and no longer need, etc. Thin paper like copy paper weight works the best. I fill my blender half full of paper not packed tight. Then fill the blender with water. Blend until it is smooth. Then strain. You now have pulp ready to use. If using soap or candy molds you will want to spray the molds with a cooking spray. If you are using the plastic canvas or a stencil you will not need to spray. Do however let the paper remain in the molds or on the canvas or stencils until dry. Drying time will depend on how much moisture is left, temperature and the humidity. You can keep the pulp for a few days in an airtight container. Whatever you do do not pour unused pulp down the toilet or sink. In fact I have a screen over the drain when I rinse out the blender or other things I've used.like my strainer. It is not frugal to have to call a plumber. Wow! 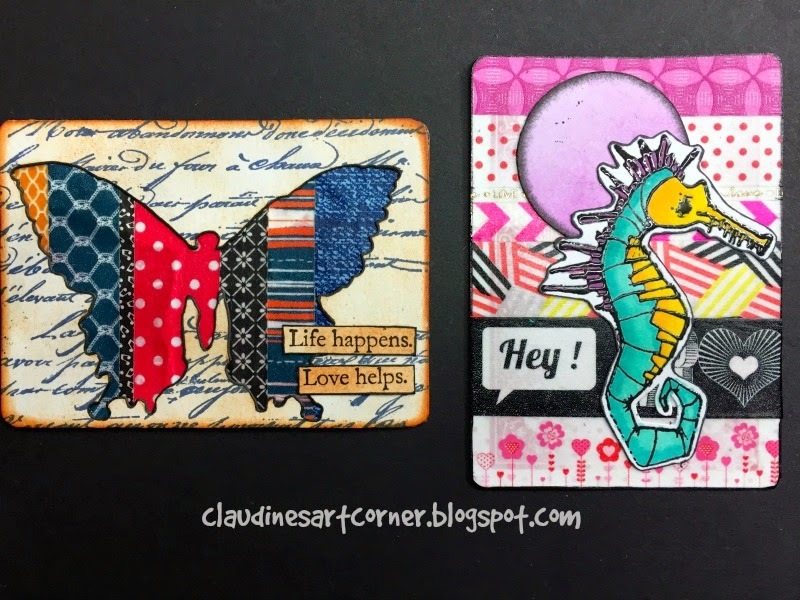 I can't believe it we are now on week 21 of the altered playing card challenge. We have had several people join recently and it is fun to see what everyone does. As far as I could tell there was no theme this week unless it was housewives. Clear embossed paste was used with stencils but since I don't have any on one card I experimented to see how String gel would work with a stencil. On the other I used moulding paste that although it is suppose to dry clear actually had a yellow tinge to it. I love how she did these cards but since I don't have those images I did my own thing. I also mixed things up a little bit as the stamps worked better on one card and the book text on another. By the way just so you know I did not tear up a library book. I used a book which a used bookseller had outside for free. Although to be honest I do feel a little guilty. Without further ado here are mine. 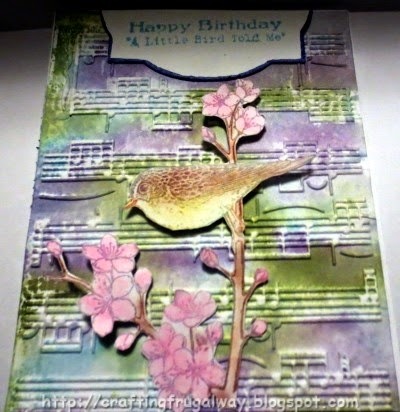 This card I did not prep but instead used my stencil and applied Liquitex String Gel with a palette knife. It was interesting that the string gel actually ended up rounded. I used Lowe Cornell metallic paint. I decided to not wipe off all the stencil area with a baby wipe. I just wiped off a portion which allows the card background to show through. I took Apple Barrel daffodil paint and applied it with my pinky. When the paint was dry I used a blue Sharpie to create my flowers from my finger print. I also used the same Sharpie to draw around the book text. I used Memento black ink and a stencil for the circles at the top. The image is a Dover image. After printing it I cut it out by hand and then colored with color pencils. For this card I used Moulding Paste over a card which I had previously applied gesso. After the paste dried I used acrylic metallic paint. Then wiped the paint off the stenciled part. Once again I used the yellow paint and my pinky. 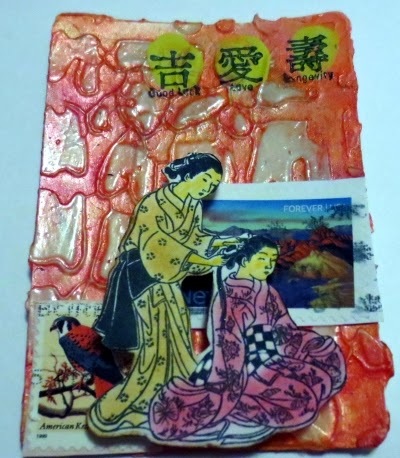 Once the paint was dried I used my Chinese Wishes mini stamps. I cut two stamps off of envelopes and adhered them to the card.. The oriental women are another Dover image. For some reason this image really speaks to me. I turned it into a print and cut. They are colored with a color pencil, chalk, and a white gel pen. I pop dotted them onto the card. You know me I own stock in the adhesive foam company. I must because cleaning and organizing I found several packages of it. I'm not going to run out any day soon. I love that the one stamp is a forever stamp so the word forever is visible. To me it goes with the love wish stamp. I wasn't sure how I was going to put together my cards this morning when I saw Claudine's post but they both pretty much put themselves together. I especially love how the oriental card turned out as I've been wanting to use that image for a long time. The chalk on the young girl's kimono ended up not being the red that I thought it was but it still works. Lol! I haven't really used book text before and never used canceled stamps. Now as I sort through papers I'll be cutting the stamps off of envelopes to save. I hope I'll get mail with more than flag stamps. It is still going to take awhile before I don't feel totally guilty using books in crafting. Do you use canceled stamps or tear up books and use them? I made up some paper pulp from old bills and papers I had printed out but no longer needed over the weekend. I had forgotten how little paper pulp is needed for paper casting with embossing folders, plastic canvas, mini soap molds, etc. Next time I won't make up so much pulp as I really don't have a lot of space for drying things which is why I no longer make my own paper. I saw in a scrapbook book where the pulp was put directly on a page using plastic canvas shapes but I never could get it to work. You know me I like to experiment and discovered that paper pulp can be used with stencils. I only did one stenciled heart to try it out but it worked. It took a bit to figure out how to use the pulp with embossing folders but I love the paper castings using embossing folders. It is a different look from embossing regular paper or card. Later on I'll do a tutorial on it. In them meantime I have a little bit of pulp left so I'm off to play and experiment some more.